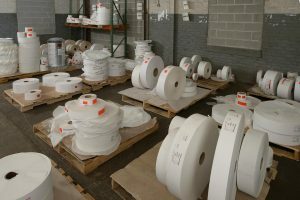 If you can dream it, we can label it - Springfield Label & Tape | We are sensitive to pressure. From packaging labels to asset identity tags to two-way decals, we’ll work with you to create the label you need with the functionality you want. 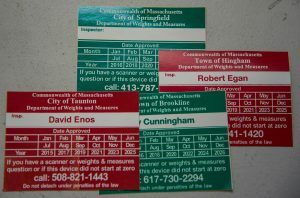 Adhesive-printed labels: printing on the adhesive side of the label. designed for use in laser or inkjet printers, this is a popular option if you need to produce high volumes of labels quickly. Laser printers use toner that fuses to the label sheets. 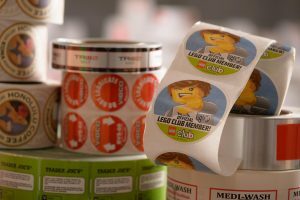 Inkjet labels use water-based inks to print on substrates. Both options serve as a perfect solution for office environments, and can be used with almost any brand laser printer available. as the label and ribbon pass through the print-head together, the ink from the ribbon is melted and transferred to the face of the label. use a face sheet chemically treated to turn black when in contact with heat. As the direct thermal label passes through the print-head, the heat of the print-head activates the face sheet changing the color from white to black. No ribbons are required. special opaque label material blocks out text or images underneath. customized combinations of material and adhesive are used to create the perfect sized label for your needs. durable weatherproof and waterproof labels capable of withstanding harsh environments. images are pressed into label material so that the image is raised above the label surface. fold-out or pop-out labels that increase packaging space to convey in-depth information. made of thin, clear plastic that sticks to the inside of a window facing out, with the content reverse printed to be read through the glass. instant redeemable coupons that can be cleanly peeled off leaving no adhesive residue. product labels on carton or packaging that provide nutritional information, product details, barcodes, or similar manufacturing specifics. consumer-facing labels with rich graphic design elements printed on high-quality label stock. thin vinyl film that clings with static electricity to different surfaces, and can be easily removed, repositioned and reused. printed on both sides with adhesive on one side so that the print can be seen on both sides of the glass. printed with your serialized barcodes, consecutive number labels and variable image labels.